Let us be honest – there are no rugs that are essentially “pet proof”! If you come across some marked that way, it is better to steer clear as there are chances that it is a scam, since these rugs don’t exist. However, you can still find rugs that feature the characteristics that improve longevity and ensure they look good, even if you have a canine buddy at home. Different rugs are made of different fabrics, and some stand up better to pet-precipitated abuse than others do. Wool (extremely expensive) and nylon are among the most resilient and durable options, although polyester is also a good choice. Olefin is a marginally acceptable material for rug construction, but those made from rayon and silk are best avoided. When it comes to color, dark colors are obviously the wiser choice as the dirt won’t be as visible as it will be in the case of lighter ones. But you need to consider your dog’s color too. Even if he isn’t a heavy shedder, he will still contribute his own fibers to those of the rug. 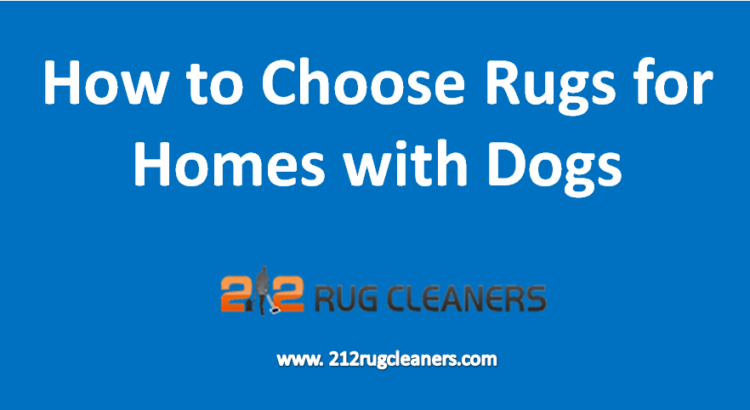 Put a dark rug in a home with a light-colored pup, and you are likely to spend all your time vacuuming up his hair. Pattern might not seem important, but it is as crucial as selecting the color because it makes a huge difference in the way it shows dog hair. For instance, single-color, plain rugs make you see each and every hair against the solid background, but elaborately patterned rugs can de-emphasize your dog’s shed fur. Stay away from these types! Even dogs that aren’t problem chewers seem magnetically attracted to the fringe or other loose threads attached to the edges of rugs, blankets, curtains and other fabrics. If they are swallowed by the dog, it can lead to intestinal blockage and essentially wreak havoc on your pet’s health. Glue-backed or tufted rugs have a material glued on at the bottom. Urine and feces can soak through the glue, which causes permanent damage, not to mention gives off highly unpleasant odors. If your main criterion is durability, outdoor rugs are just what you are looking for. Even if they aren’t made using the same level of finesse and craftsmanship as their indoor counterparts, they are the best choice for homes with pets. Keep these pointers in mind before you buy a carpet – it will help you make the right choice!